All projects that I when I run by the windows or the wine, after a run-time (time that it varies greatly) he gives a "Crash" in Gideros player. In mobile versions the same crash does not happen. I tested on ubuntu with the latest version of wine and windows 7. It was the same with someone in the forum? @kinrpg can you try to isolate the code that crashes and provide smaller example? I did some more tests in my app and the "crash" of randomly. There are times when the app runs for 15 minutes and al buga other runs for 1 minute and buga. I could not set the standard. I'm going back step by step my app to do the evaluation code by code. Once you can isolate what causes back to post here. Thank you very much. It might be due to OpenGL. Can you find out what version of OpenGL is present on your computer? Recently we upgraded from OpenGL 1 to OpenGL 2 and not all computer support this fully. And it tends to give random crashes. How old is your computer? My computer is a Dell Vostro 3550 corei5 4GB ram, my systems are Windows 7 and Ubuntu 04.16 with Wine 1.7 both 64-bit. I updated in both drivers and stuff. 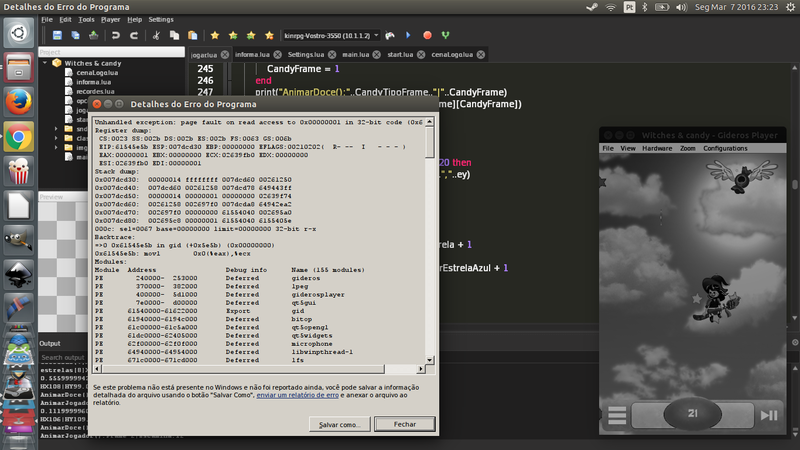 And I rewrote scratch my code, as well as reencodei the songs in mp3 (wav does not work). He stopped giving problem. I just needed to redo the program from scratch, probably because I have done all the app in a single file (main.lua) he was spoiled and messy. Now separated all functions using object orientation and crash are gone. I do not know what exactly caused the problem, but solved and the code is more readable. I am very grateful for the help and support you.